By most people’s standards Milan have just enjoyed a pretty good season. They were runners-up in the league, only behind an undefeated Juventus; they reached the quarter-finals of the Champions League before being eliminated by the mighty Barcelona; and lost in the semi-finals of the Coppa Italia. However, it was still a disappointment, as they had established a healthy lead in the race to the scudetto, and it was a backward step compared to the previous season, when they had won Serie A for the 18th time. Ibra himself had done his utmost to secure another title for the rossoneri, as his 28 league goals earned him the capocannoniere (top scorer) award for Serie A, though this was not enough to continue his remarkable record of gaining a league winners’ medal every season since 2003 (with Ajax, Juventus, Inter, Barcelona and Milan). 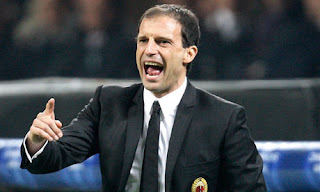 However, whether it was down to injuries, second season syndrome for Allegri or the simple fact that the team was not quite good enough, the fact remains that Milan did not win any silverware – unless you count the 2011 Supercoppa, the curtain raiser to the new season. “Close, but no cigar” is not good enough for a side that has a fantastic record in winning trophies, including the Champions League on an incredible seven occasions (only bettered by Real Madrid) and the European Cup Winners’ Cup twice. No matter how impressive Milan have been in the past – and they can lay claim to having the best side of all time under Sacchi – they are now facing daunting challenges, both on and off the pitch. Many of the old guard have left the club this summer, including the elegant defender Alessandro Nesta, the prolific Pippo Inzaghi, the tigerish Rino Gattuso, Mark Van Bommel and Gianluca Zambrotta. In addition, there are question marks over the veteran Clarence Seedorf, who is mulling over a one-year extension, and the club has not exercised loan options for Maxi Lopez and Alberto Aquilani (though the latter may yet sign on a reduced package). That’s a lot of experience to try to replace in one fell swoop. This mission is made more difficult by Milan’s financial situation, which is by no means disastrous, but is bad enough to give the club pause for thought. Their traditional modus operandi has been to operate with substantial losses, which are then covered by the owners, but this will not be possible in the new world of UEFA’s Financial Fair Play (FFP) rules where clubs will have to live within their means without the assistance of a wealthy benefactor. This will test to the limit the negotiating skills of Milan’s vice-president Adriano Galliani, who has proved himself to be a wily old fox in the past, especially when he snapped up Ibrahimovic from Barcelona for around a third of the price that the Catalans paid a year before. The need for Milan to find bargains was further emphasised this summer when they signed two international midfielders on Bosman free transfers: Riccardo Montolivo from Fiorentina and Bakaye Traoré from Nancy. When you look at the club’s most recent accounts (for the year up to 31 December 2011), you begin to understand what the big Swede is talking about, as these reported a thumping great loss of €67.3 million. Amazingly this actually represented a slight (€2.4 million) improvement on the previous year’s loss of €69.8 million, an indication of Milan’s structural weaknesses. The losses in both years would have surpassed €80 million without the benefit of substantial tax credits, €15.7 million in 2010 and €13.3 million in 2011. Revenue grew by 7% to €234.8 million, but this was matched by a €13.7 million increase in the wage bill to €206.5 million, a record high for Milan. Note that this definition of revenue excludes €23.6 million profit on player sales and €8.4 million increase in the value of fixed assets (shown elsewhere). If these are added back, we get the €266.8 million of revenue mentioned in the club’s press release. This produced operating an operating loss of around €100 million level for the second consecutive year, which is distinctly uncomfortable for a club aiming to be self-sufficient in the near future. I should clarify that this analysis is based on the accounts for the consolidated Milan Group, as opposed to just the football club AC Milan SpA, as these are the accounts that will be used for UEFA’s FFP review. The group accounts include Milan Entertainment SpA and Milan Real Estate SpA, but there is not a significant difference. 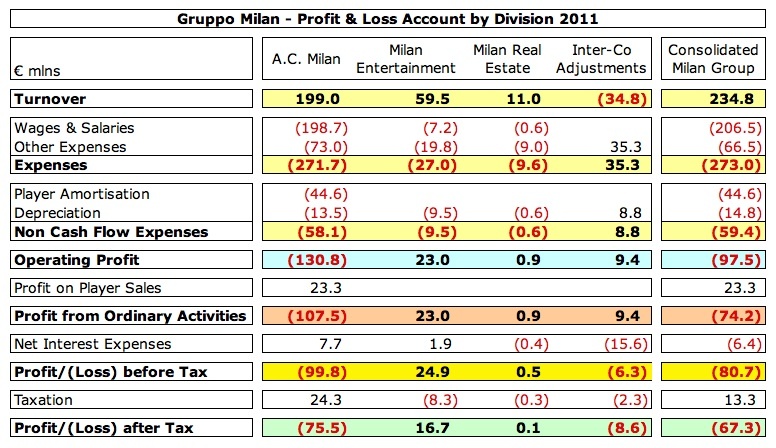 In fact, the loss of €67.3 million for Milan Group is €8.2 million better than the €75.5 million registered by AC Milan SpA. Milan’s poor financial performance is nothing new. The last time that the club made money was 2006 and even then the €11.9 million profit was heavily influenced by once-off factors, namely the €40 million profit from selling Andriy Shevchenko to Chelsea and a €27 million once-off payment for an option on future TV rights. Since then, there have been five consecutive years of losses, adding up to a combined deficit of around a quarter of a billion Euros. 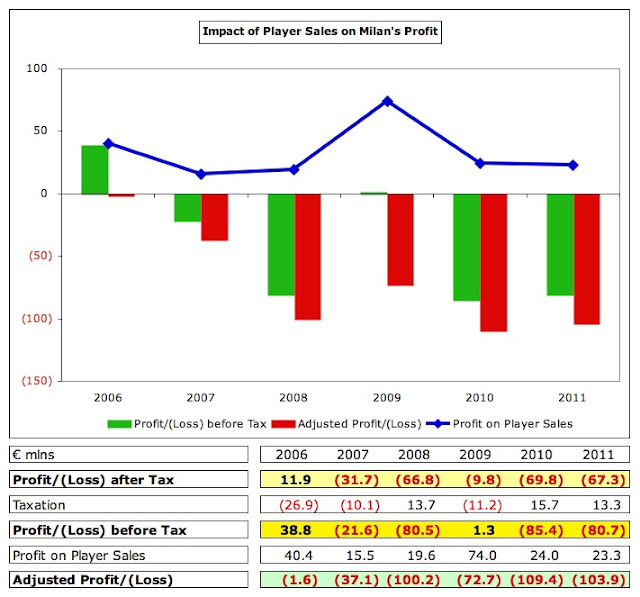 The only recent year that looks good on paper is 2009, when the loss was “only” €9.8 million, but this was almost entirely due to the hefty €74 million profit on player sales, arising from the transfers of Kaká to Real Madrid and Yoann Gourcuff to Bordeaux. As we have seen, it is difficult, if not impossible, to raise similar sums form player sales every year, not to mention the detrimental effect it would have on the team. In each of the last two years Milan have generated €23-24 million from this activity, much of which has been derived from the special relationship that they appear to have with Genoa, who have contributed over €30 million in this period, including €17 million in 2011: Alexander Merkel €9.9 million, Nicola Pasini €3.3 million, Mario Sampirisi €2.0 million and Sokratis Papastathopoulos €1.8 million. One more technical point: for profits on player sales I take the plusvalenze less the minusvalenze to give a net figure, e.g. in 2011 €23.6 million minus €0.3 million (to release Onyewu Oguchi) gives the €23.3 million in my schedule. If we exclude tax movements and profit from player sales, then the adjusted loss for Milan over the last four years would add up to a colossal €386 million with three of those four years coming in over the €100 million mark. 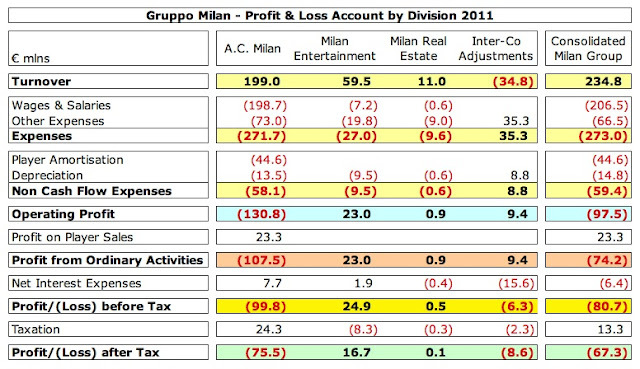 In other words, with the sale of a world class player Milan make losses; without such a sale they make large losses. Of course, Milan are not the only leading Italian club to find themselves in this situation. 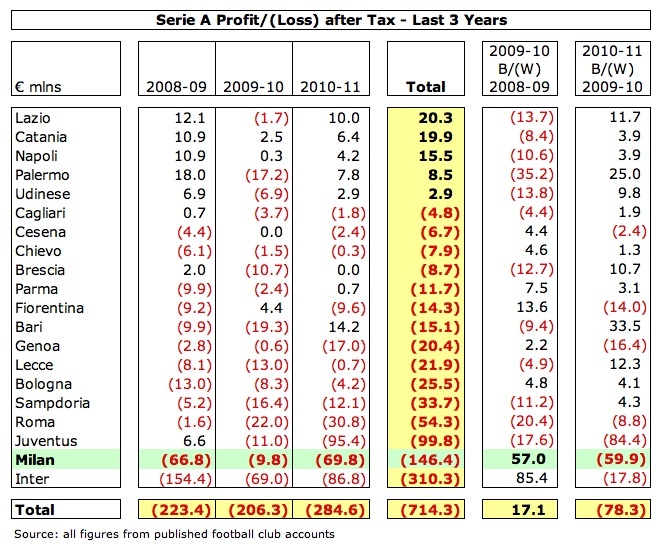 Indeed, in 2010/11 the losses were even higher at Juventus (€95.4 million) and Inter (€86.8 million). The big three contributed 89% (€252 million) of the total Serie A losses of €285 million. Note that I have used Milan’s 2010 loss in this schedule to be consistent with a survey prepared by La Gazzetta dello Sport, but the loss is around the same level in any case. 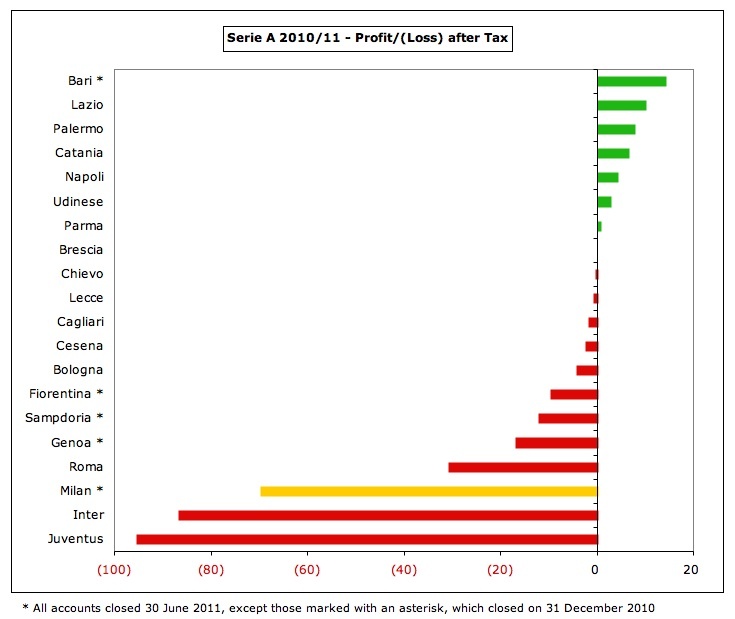 More encouragingly for Italy’s top flight is that the number of clubs making a profit in 2010/11 doubled from the four in the previous season to eight (Bari, Lazio, Palermo, Catania, Napoli, Udinese, Parma and Brescia). This list includes two clubs that qualified for the Champions League (Napoli and Udinese), so sound husbandry of a club’s finances need not necessarily mean lack of success, though it should be acknowledged that some did benefit from substantial player sales. Over the last three seasons it has been more or less the same story of colossal losses at both Milan clubs, who are by some distance bottom of Italy’s profit league. Juve’s losses over the period are virtually all because of 2010/11, mainly due to not qualifying for the Champions League and investing in their new stadium, while Milan and Inter’s figures have been consistently poor. At least Milan win the financial Derby della Madonnina with Inter’s astonishing losses of €310 million in this period being more than twice Milan’s €146 million. In truth, neither club has much to write home about on this topic. But surely all the top football clubs lose money, right? Actually, that’s not really the case, as a few did report profits in 2010/11: Real Madrid made a sizeable €47 million, thanks largely to their enormous revenue; Arsenal €14 million, boosted by property sales; and Manchester United €11 million, as their awesome cash generating capacity was enough to cover interest charges on their massive debt. Bayern Munich only recorded a small profit of €1 million, but this represented their 19th consecutive year of profits. Even big spending Barcelona’s loss was relatively small at €9 million. Of course, some leading clubs abroad also employ the sugar daddy model, such as Champions League winners Chelsea, who made a loss of €75 million, while Manchester City’s attempt to gatecrash the party cost them €219 million. 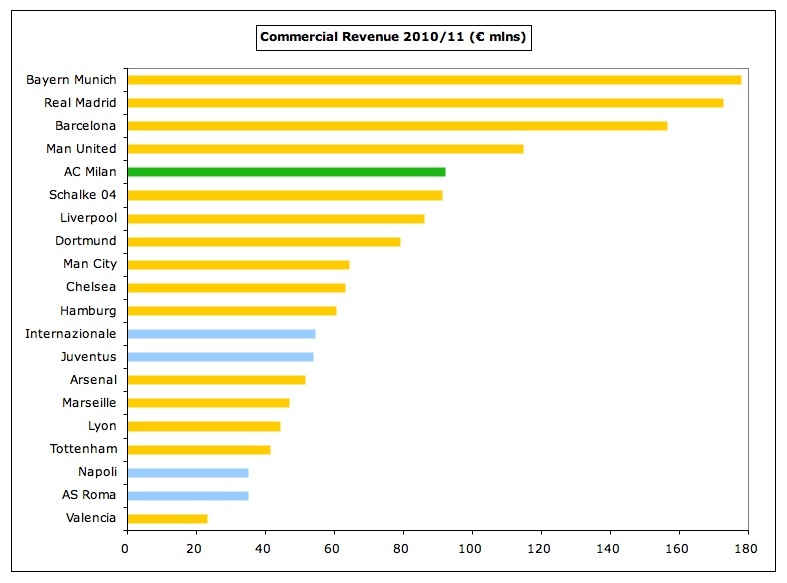 Even so, it is clear that Juventus, Inter and Milan all face more serious issues compared to the others, as their ability to generate additional revenue in the short-term is more constrained. 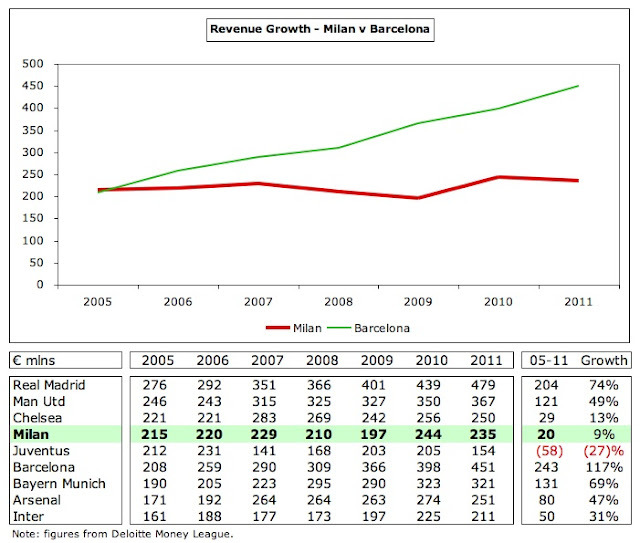 That said, Milan’s revenue is not too shabby by Italian standards. 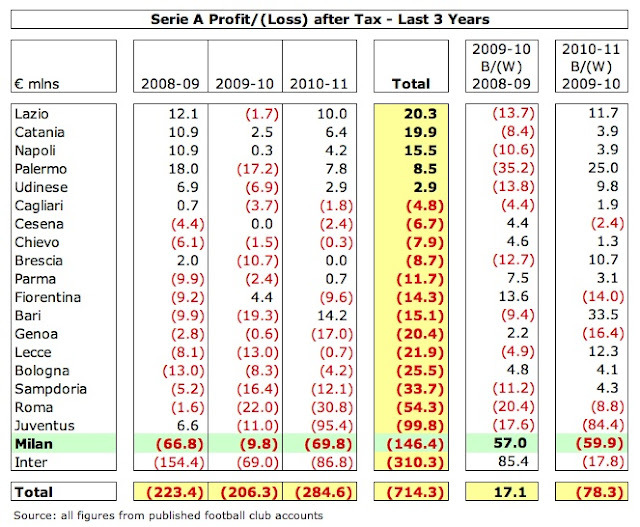 In fact, for 2010/11 (the last season when all clubs have published accounts), their revenue of €220 million was the highest with only Inter anywhere near them (€211 million). The other clubs were miles behind with only three others earning above €100 million: Juventus €154 million, Roma €144 million and Napoli €115 million. This is despite the leading lights effectively transferring some of their revenue to the others after the collective TV deal was implemented. However, as John Donne said, “No man is an island” and Milan also have to look beyond their borders at other European clubs. At first glance, Milan appear to be sitting pretty at seventh place in Deloitte’s Money League, but problems begin to emerge on a closer inspection, as they are a long way short of their peers abroad. In particular, the Spanish giants generate significantly more revenue with Real Madrid (€479 million) and Barcelona (€451 million) earning around twice as much as Milan, benefiting from huge individual TV deals. Both Manchester United (€367 million) and Bayer Munich (€321 million) earn around €100 million more than the rossoneri, the English taking advantage of significantly higher match day revenue, while the Germans’ commercial expertise puts everyone else to shame. In fact, at the latest exchange rates United would also break the €400 million barrier. This vast revenue discrepancy makes it difficult to compete, especially when that shortfall in turnover occurs every year. Eagle-eyed observers will have noticed that Milan’s revenue figure of €235 million is different to the €253.2 million included in the club’s accounts for 2010. There are two reasons for this. 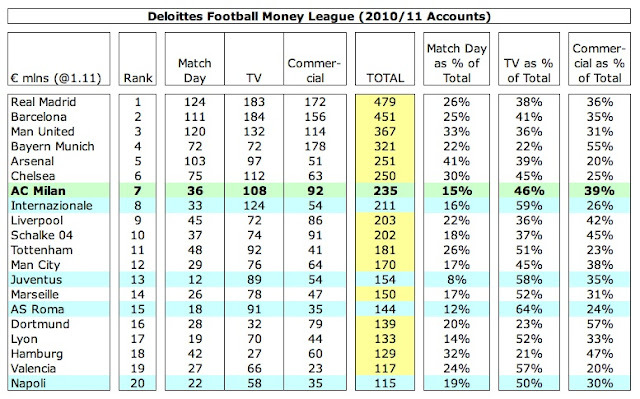 First, in order to be consistent with other countries, Deloitte excludes: (a) player loans €0.5 million; (b) profit from player sales €25.5 million; (c) change in asset values €7.6 million. Adding those to the €220 million shown in my analysis gives the €253.2 million reported in Italy. 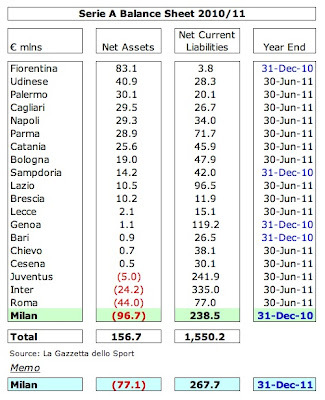 Second, Milan’s accounts cover a calendar year (up to 31 December), while the majority of clubs’ figures coincide with the football season, so the accounting close is in June. Because of this anomaly, Deloitte adjust Milan’s figures based on information provided by the club, leading to the €235 million in their league table. Regardless of all these technical adjustments, the underlying themes for Milan (and Italian football) are very much the same. A recent report from the Italian Football Federation (FIGC) concluded, “The current business model is difficult to sustain and not very competitive.” Its president, Giancarlo Abate, noted that in particular match day income, sponsorships and merchandising were in need of urgent attention to reduce the reliance on TV money. Essentially, Milan’s revenue has been flat for the last few years, though this disguises two opposing factors: TV revenue has fallen by €29 million since 2006 to €114 million, largely due to the move to a collective deal, while commercial income has increased by €23 million to an impressive €91 million. 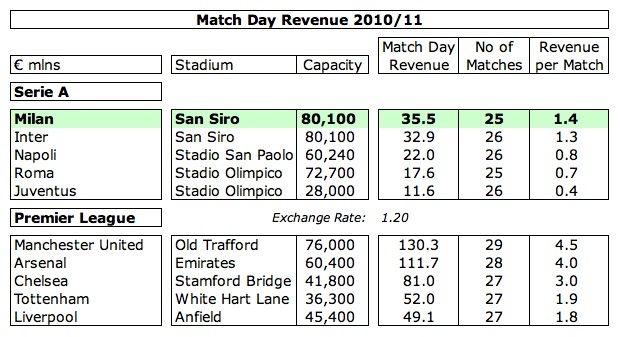 Match day revenue has also risen by €3 million, though it remains a feeble €29 million, just 13% of total revenue, which, in fairness, is typical of all Italian clubs and helps explain their relative revenue weakness. 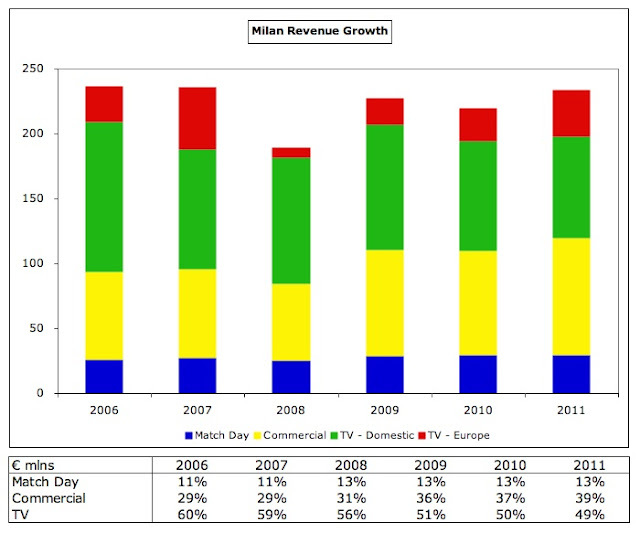 Despite the decline in TV revenue, it is still the most important revenue stream, accounting for just under half of Milan’s revenue. This is partly due to the higher payout from the Champions League, which rose €16 million in 2011, more than offsetting the €7 million fall in domestic TV money. The €114 million earned from television in 2011 comprised €78 million from the domestic deal and €36 million from the Champions League (a combination of the last 16 in 2010/11 and the group stage in 2011/12). They received the third highest domestic money, just behind Juventus and Inter, but a fair bit more than other Italian clubs, e.g. Napoli and Roma got around €60 million; Lazio about €50 million; and Fiorentina, Palermo and Udinese around €40 million. This represents an improvement for mid-tier clubs following the implementation of the new collective agreement in 2010/11. Under the new allocation, 40% is divided equally among the Serie A clubs; 30% is based on past results (5% last season, 15% last 5 years, 10% from 1946 to the sixth season before last); and 30% is based on the population of the club’s city (5%) and the number of fans (25%). 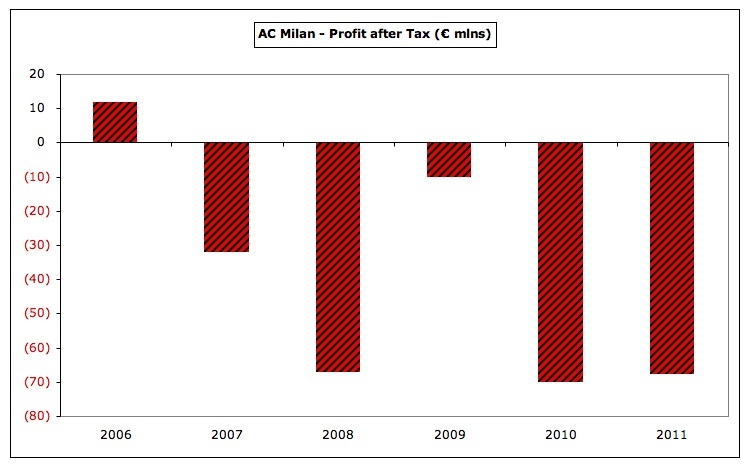 The result is a reduction at the top end, so Galliani is not a happy customer, “In football big teams have to share income with other sides and this is an anomaly.” This may be a bitter pill to swallow, but it has been sweetened by the distribution formula, which still favours the top clubs to an extent with the allocations based on historical success and number of fans. 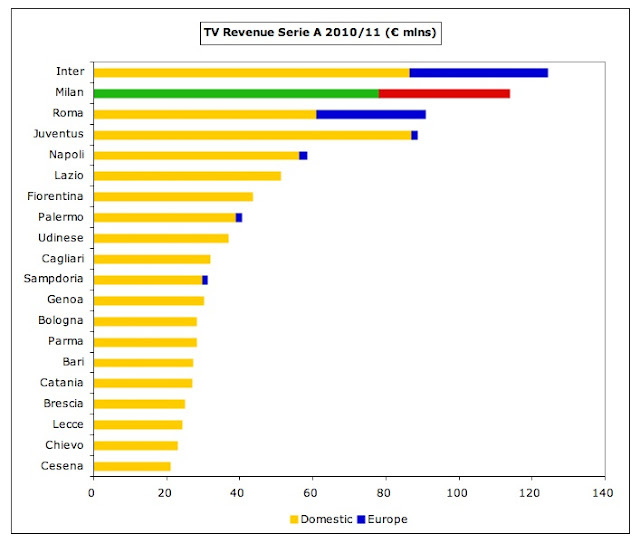 Even now, Milan’s TV income is the sixth highest in Europe. Furthermore, the decrease would have been even higher if the total money negotiated in the new deal had not been 20% higher than before at around €1 billion a year. 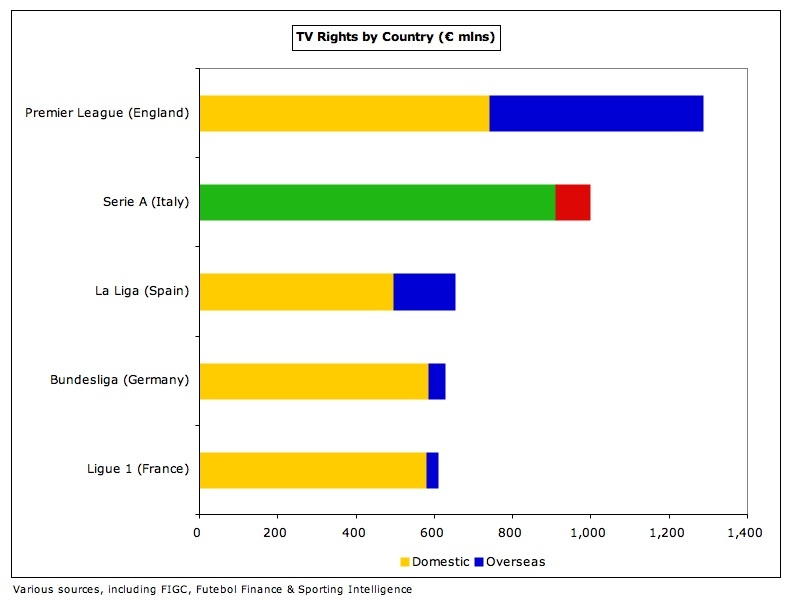 This cemented Italy’s position as the second highest TV rights deal in Europe, only behind the Premier League, but significantly ahead of the other major leagues, despite the Bundesliga increasing its rights by over 50% for the next four-year deal. The new French contract has actually fallen from €668 million to €612 million, considered a good result in this harsh economic climate. As you might expect for a club with media magnate Silvio Berlusconi at the helm, television income has always been important to Milan, climbing as high as €140 million in 2007, the highest in Europe, partly due to a sensational domestic deal, but also thanks to the payment received for winning the Champions League. Qualification for the Champions League is imperative for Milan with the accounts identifying this as a key risk for the club’s economic prospects. This can be seen in 2008/09, when Milan earned just €0.4 million from the UEFA Cup, compared to €25.8 million from the Champions League in 2010/11. This was made up of €7.2 million participation fees, €2.4 million for performances in the group (2 wins at €800k plus 2 draws at €400k), €3 million for reaching the last 16 and €13.2 million from the TV (“market”) pool. The money received for 2011/12 should be much higher: (a) Milan progressed further (to the quarter-finals); (b) they will receive more from the TV pool, as they won Serie A in 2010/11 (half is allocated based on finishing positions in the previous season’s domestic league). The size of the prize is now enormous, as we can see from the finalists in 2010/11 (Barcelona and Manchester United) each receiving over €50 million, not including additional gate receipts or increases in sponsorship payments. Financially, the Europa League provides little compensations, with the four Italian clubs only receiving around €2 million each. 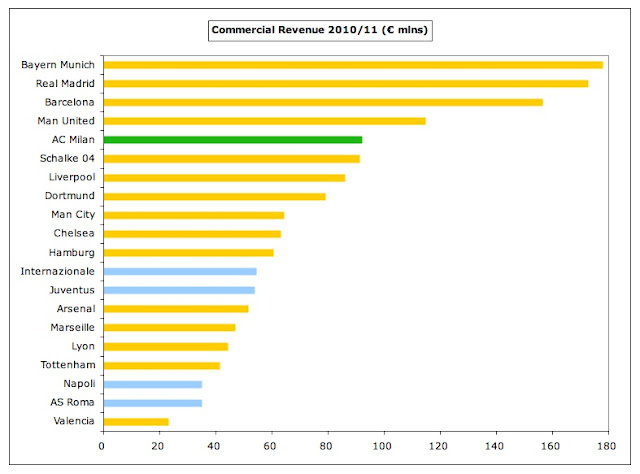 Furthermore, there has been talk in the English media of Champions League revenue significantly increasing in the next three-year agreement, citing David Taylor, UEFA Events’ chief executive, “We have at least achieved triple-digit growth.” Unfortunately the Italian league has lost a place to the Bundesliga, due to lower coefficients, so now only the top two teams in Serie A are assured of direct entry, while the third-placed team goes into the preliminary qualifying round. 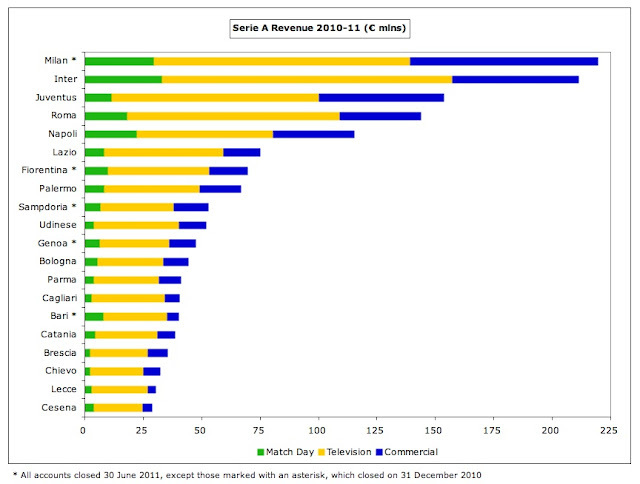 The most glaring revenue weakness for Milan is match day revenue. Even though this is the highest in Italy at €36 million (ahead of Inter €33 million, Napoli €22 million and Roma €18 million), it is dwarfed by major clubs in other countries, especially England. Chelsea earn more than twice as much €81 million, while Manchester United €130 million and Arsenal €112 million generate around three times Milan’s figure. 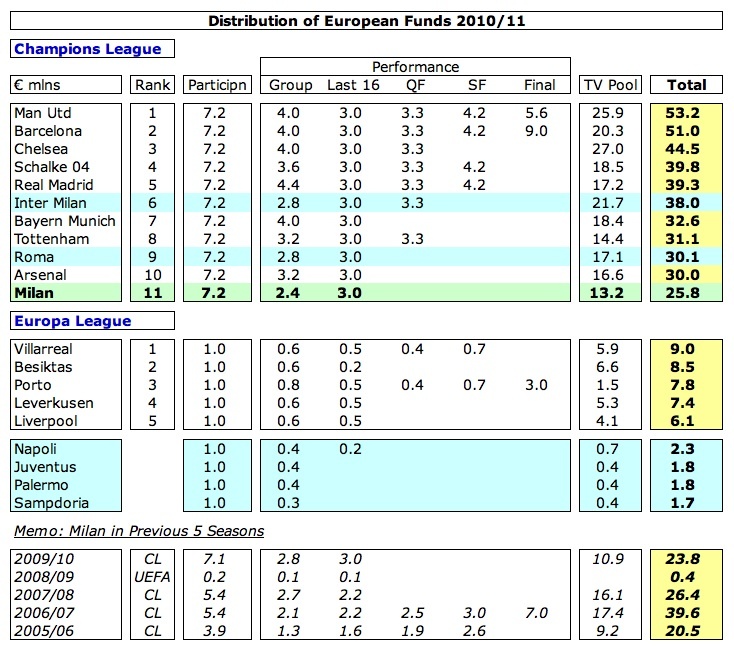 Granted, they have staged more home games, but United earn €4.5 million a match compared to Milan’s €1.4 million. 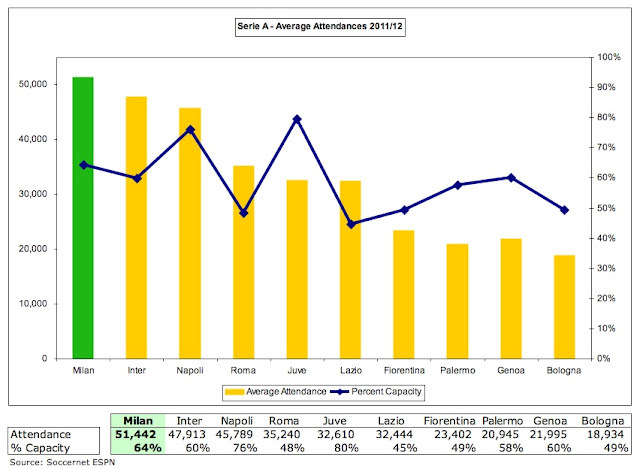 Although Milan have the highest average attendance in Italy of 51,400, this was a 4% reduction from the previous season and means that only 64% of the stadium’s capacity was filled. 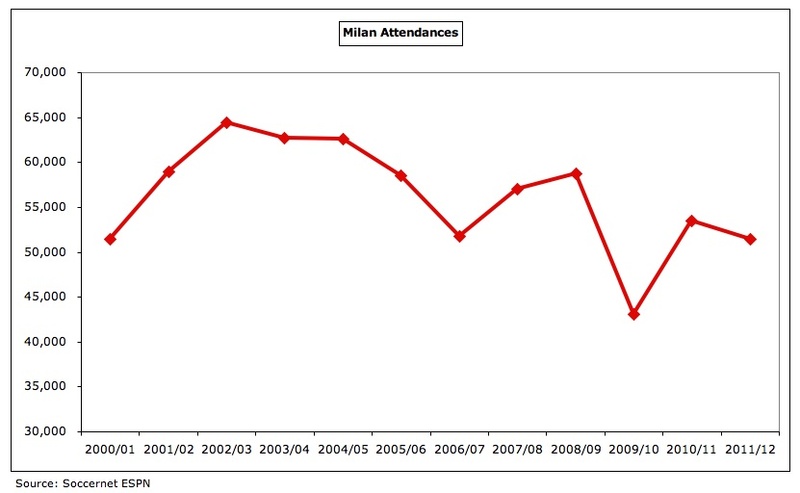 In fact, Milan’s crowds have dropped significantly from the 64,500 average achieved in 2002/03. In fairness, this is a generic problem in Italy, where total attendances in Serie A have slumped from 9.4 million in 2008/09 to 8.9 million in 2010/11 (per the FIGC), despite low ticket prices, due to a combination of obsolete stadiums, poor views and, let’s be frank, the suspicion of match fixing. Galliani recently revealed that the club had tried to buy San Siro, but the price quoted by the council was too high, so they have instead turned their attention to modernising the ground in order to develop an “elite stadium”, ready for the 2015 Champions League final. However, he admitted that this was not ideal, due to “the problems that follow when you share it with another club.” Any new development will be a long-term project, e.g. even Juve’s new stadium took more than 10 years to complete after the first discussions with their local council. It had been hoped that new stadiums would be developed as part of Italy’s bid for Euro 2016, but unfortunately this was lost to France, as was the catalyst for government intervention. Galliani warned, “Germany have overtaken us thanks to the wonderful new stadiums they built for the World Cup in 2006. Thanks to the new stadiums being built for Euro 2016, I predict that the French will also overtake us.” This is why Italian owners hope that new laws will be introduced to facilitate new stadium construction. 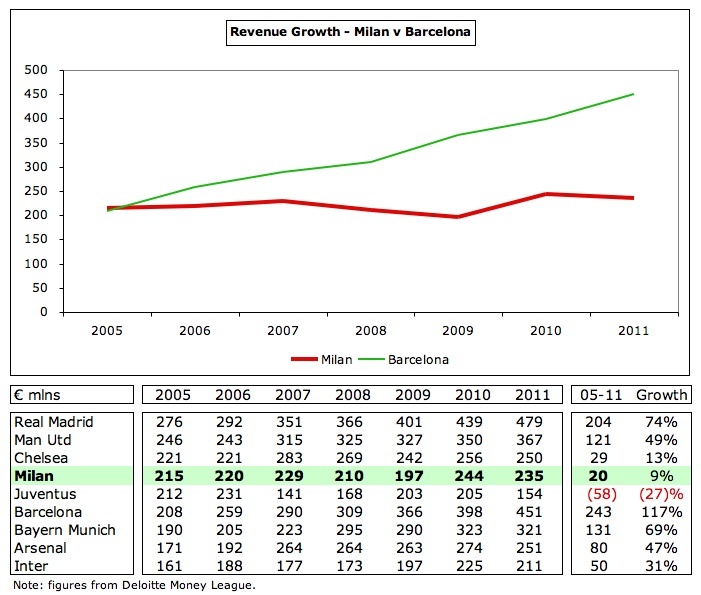 Where Milan have really begun to motor is in their commercial operations, as revenue here has really taken off in the last two years, rising by €10 million (13%) in 2011 alone to €91 million. This is not only the highest in Italy by some distance (Inter and Juventus are the closest challengers at €54 million apiece), but is also the fifth highest in Europe. That said, Milan still only earn half as much as Bayern Munich’s astonishing €178 million and are a long way behind Real Madrid’s €172 million and Barcelona’s €156 million. Commercial revenue was inflated by once-off payments in 2009 and 2010: the former contained €20 million for the sale of Milan’s image archive, while the latter included €5 million for the sale of some apartments. Excluding these once-off items, the underlying growth since 2009 has been a very impressive 50%, partly due to the partnership with Infront, who handle all sponsorships except kit deals. Progress can be measured by the raft of new sponsors signed up in the last 12 months, including Taci Oil, Indesit, United Biscuits and Nivea for Men. Milan have long-term deals with their shirt sponsor and kit supplier. The Emirates contract runs until 2015 and is worth a guaranteed €12 million a season plus performance related bonuses (€2.7 million in 2011), while the Adidas kit deal has been extended to 2017, generating €17.5 million last year, including a €1 million performance bonus. These deals compare pretty favourably with those at other Italian clubs (a) shirt sponsors: Inter – Pirelli €12 million, Juventus – BetClic €8 million, Napoli – Lete €5.5 million and Roma – Wind €5 million; (b) kit suppliers: Inter – Nike €12 million, Juventus – Nike €12 million, Roma – Kappa €5 million and Napoli – Macron €4.7 million. Milan reportedly sell between 400,000 and 600,000 shirts a season, which would put them in the top ten clubs worldwide and around the same level as Inter and Juventus, though the likes of Real Madrid and Manchester United sell nearly three times as many. 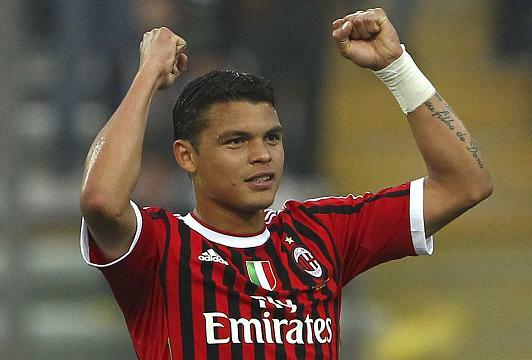 The rossoneri are now looking to make more from global opportunities, e.g. this summer they will play prestigious friendlies against Real Madrid and Chelsea in the United States. Fundamentally, the most important challenge for Milan is the wage bill, which rose €14 million in 2011 to a totally unsustainable €206 million. 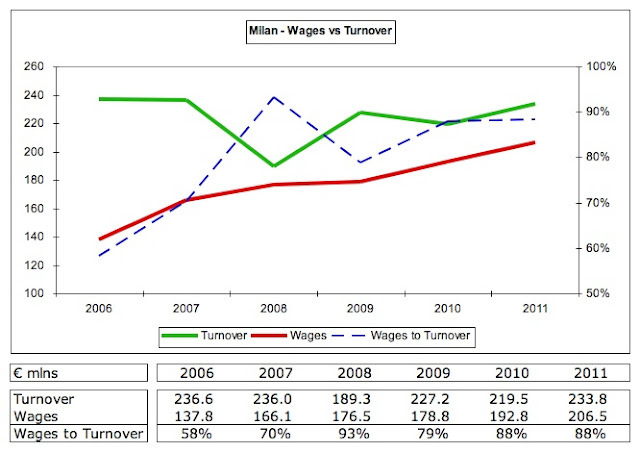 Even though most of this increase was due to higher bonuses for winning the scudetto in 2011, the fact remains that this is the highest wage bill in Milan’s history and the second highest ever for Serie A, only surpassed by the €234 million paid out by Inter in their 2009/10 treble winning season. Since 2006 wages have grown by 50% from €138 million to €206 million, while revenue has actually decreased by €3 million in the same period, leading to a rise in the important wages to turnover ratio from 58% to 88%. This is much worse than UEFA’s recommended maximum limit of 70%, though Milan are far from alone in struggling to confront this issue in Italy, as seen by Juventus (91%) and Inter (90%). In Italy only Inter come anywhere near Milan’s wage bill. In 2010/11 they were just behind Milan’s €193 million with €190 million, while the next highest were Juventus €140 million and Roma €107 million. To place Milan’s wage bill into context, it is around the same as Fiorentina €55 million, Genoa €52 million, Napoli €52 million and Lazio €39 million combined. An analysis by La Gazzetta last summer suggested that the cost of Milan’s first team squad of €160 million was far above Inter’s €145 million, but it’s far from certain that their figures are accurate. Milan’s wage bill also looks excessive in comparison with foreign clubs, only surpassed by Barcelona €241 million (including other sports), Real Madrid €216 million, Manchester City €209 million and Chelsea €202 million. 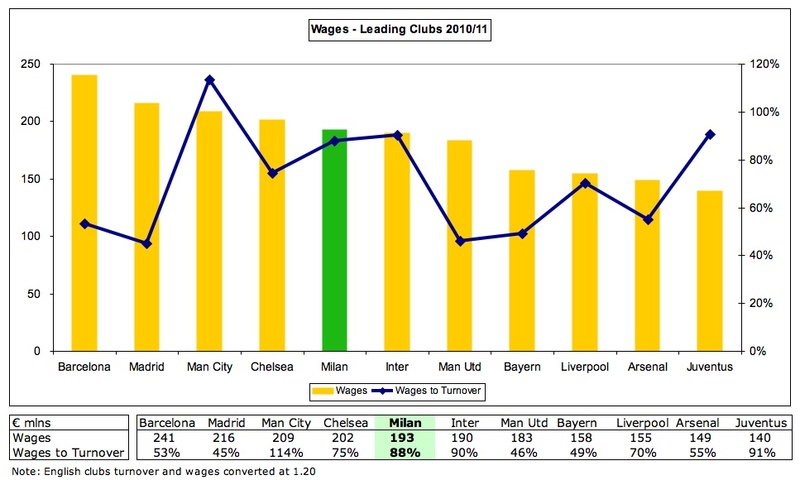 Strikingly, it is higher than Manchester United and Bayern Munich, who have been more successful recently. It is also apparent that most of these clubs have a much better wages to turnover ratio than Milan, because of their higher revenue, e.g. Real Madrid 45%, Manchester United 46%, Bayern 49% and Barcelona 53%. Galliani has recognised the problem, “Both Fininvest and I are trying to reduce the amount of money spent on wages.” However, we have heard this before. Last year, he said, “Milan absolutely have to reduce the wage bill. It is difficult to increase revenue, so we have to act on the salaries and hope that the players understand, especially with financial fair play.” The problem is that it is difficult to cut the wage bill without reducing the competitiveness of the squad. That said, Allegri appears to be on message, “We had 33 players in the squad this season, but that was because we had to make some adjustments in January because of injuries. We’ll have a 25-26 man squad, including three goalkeepers, for the new season.” Many senior players have left this summer, while others will be only be given contract extensions on reduced terms, e.g. Flamini has reportedly been offered €1.75 million instead of his current €4 million, while any offer to Aquilani will also be much lower. Using salary figures from La Gazzetta, the gross saving would be at least €30 million. Clearly some players will need to be replaced, but the cost should be much less, e.g. 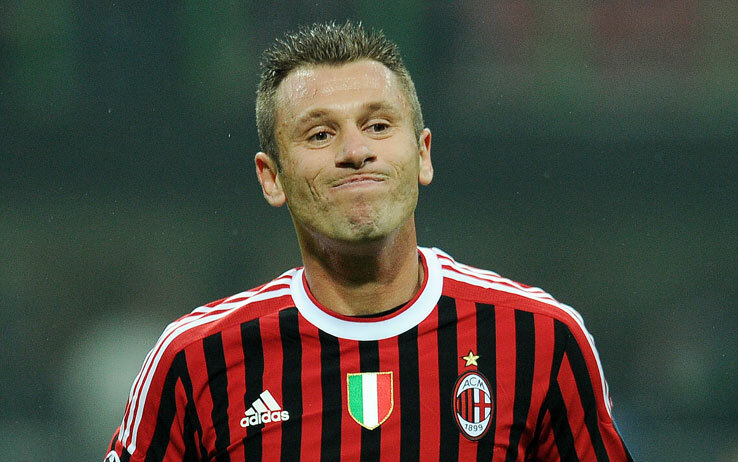 Van Bommel and Gattuso were both costing €7 million. The other element of player costs, namely amortisation, has also been rising, having doubled from €22 million in 2006 to €45 million in 2011, though it is still lower than Inter €52 million and Juventus €47 million – and miles behind a big spender like Manchester City €101 million. In addition, the club has written-down €9 million in player values in the last two years for the sales of Ronaldinho and Ricardo Oliveira. As a reminder, amortisation is the annual cost of writing-down a player’s purchase price, e.g. Ibrahimovic was signed for €24 million on a 4-year contract, but his transfer is only reflected in the profit and loss account via amortisation, which is booked evenly over the life of his contract, i.e. €6 million a year. This growth is a reflection of Milan’s activity in the transfer market, which can be divided into three periods in recent times. First, the boom time with €237 million net spend in the four years up to 2003; then the age of austerity with net sales proceeds of €18 million in the seven years up to 2010, when Milan had to “sell before we can buy” per Galliani; finally a return to investment with net spend of €51 million in the last two years. 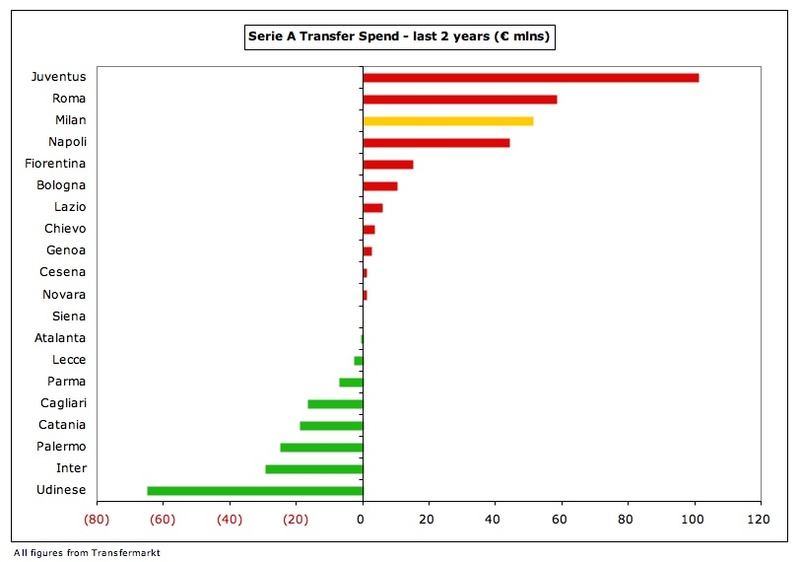 Milan might be shopping at the cheaper end of the market, e.g. Stephen El Shaarawy for €10 million and Kevin-Prince Boateng for €7.5 million, but this has still been enough to make them the third highest spenders in Serie A during this period, only beaten by Juventus €101 million and Roma €58 million. The annual deficits have resulted in net debt doubling in the last five years to stand at €292 million, comprising €156 million of bank loans plus €136 million owed to factoring companies based on future income. Most of this is short-term debt, but is supported by a €390 million line of credit from Fininvest. On top of that Milan owe other football clubs €30 million, mainly €16 million to Barcelona for Ibrahimovic and €10 million to Manchester City for Robinho, though are themselves owed €16 million by other clubs. In fairness to Milan, this is a problem throughout Italy with La Gazzetta complaining that clubs were “buried under a mountain of debt”, following the 14% increase last year to €2.6 billion, but it is worth noting that Milan’s debt breaches one of UEFA’s warning indicators, as it exceeds 100% of revenue. 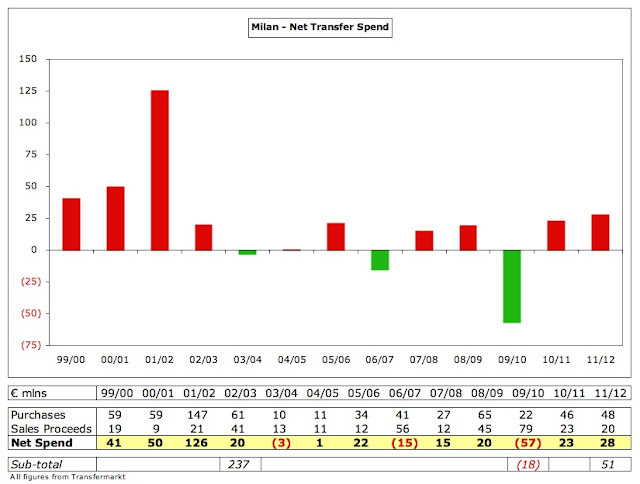 In fact, Milan’s balance sheet is the weakest in Serie A with net liabilities of €77 million, even after an improvement from €97 million the previous year. This is a little misleading, as the value of the players in the accounts of €136 million is smaller than their worth in the real world (€271 million according to Transfermarkt), but it is nevertheless an indication of the club’s financial fragility. 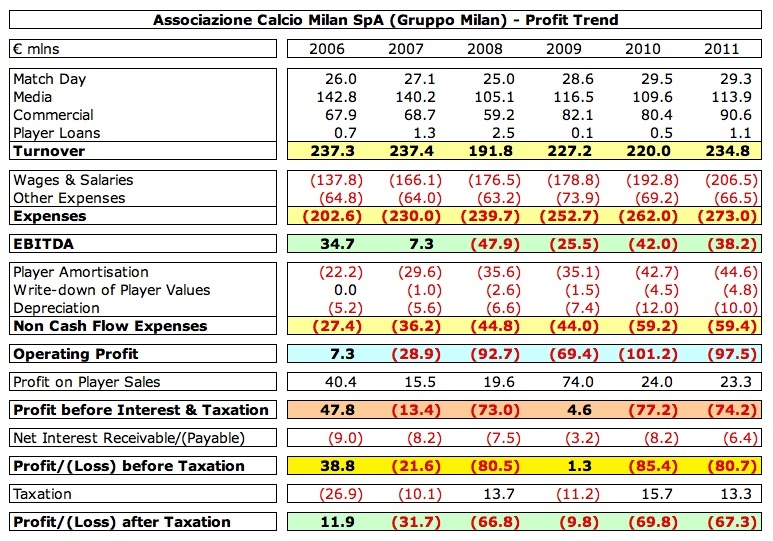 Although the cash flow statement suggests that Milan are fine at an operating level, the reality is that they cannot afford to purchase players without increasing debt and/or additional funding from the owners. Incidentally, player purchases are much higher in cash terms than has been reported in the media, presumably due to the nature of some of the rights sharing deals with Genoa. These difficulties have raised the prospect of Berlusconi selling Milan, especially as Fininvest is not exactly thriving in today’s tough economy, exacerbated by the €560 million fine following a court ruling that it bribed a judge during the Mondadori takeover battle. His daughter Barbara, who joined the board in 2011 “to reaffirm and strengthen the tie between the team and the family”, has said that her father has no intention of moving on, but there has been talk of selling a 40% stake to an overseas investor, though they might be put off by the stadium issue. Even if Berlusconi did want to return to the good old days with a few extravagant purchases, he needs to be mindful of UEFA’s Financial Fair Play regulations, which will ultimately exclude from European competitions clubs that continue to make losses. Fortunately for Milan, all of the losses made to date are not considered for FFP, but they have to get their act together immediately, as the first monitoring period will taken into account losses made in 2012 and 2013. However, they don’t need to be absolutely perfect, as wealthy owners will be allowed to absorb aggregate losses (“acceptable deviations”) of €45 million, initially over two years and then over a three-year monitoring period, as long as they are willing to cover the deficit by making equity contributions. Alternatively, Milan could boost profits by selling players and both Thiago Silva and Ibrahimovic are much in demand, though the dilemma was neatly summarised by club legend Paolo Maldini, “If you want to win something, then you can’t do without them. If the objective is to balance the accounts and have a decent campaign, then you can sacrifice one of the two.” On the other hand, the club might be willing to listen to offers for Robinho or Pato, who are not indispensable. 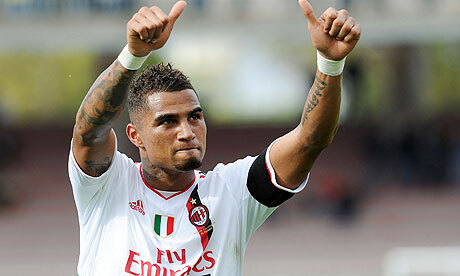 "KPB - a prince among men"
In a certain sense FFP might actually point the way forward for Milan, as the break-even analysis excludes costs for stadium development and the youth academy. The latter has proved a little disappointing in recent years, especially when you consider that Milan’s greatest teams have always included many in-house products like Franco Baresi, Billy Costacurta and that man Maldini, but Galliani only last week stressed the importance of youth players breaking into the first team. Right now, Milan will need to show some fancy footwork to improve their finances, while maintaining their ability to challenge at the highest levels. Ibrahimovic has already voiced his disquiet about the change in direction, “There used to be a great Milan project, now we’ll have to see if they take it forward”, but the Berlusconi-Galliani axis really don’t have too many options. If they do manage to pull this off, then we will have to accept that the devil really does have all the best tunes. Throughly researched once again and as a Milan fan I'm a bit scared. Thanks a lot for making it, read wonderfully. Must read for any Milan / Serie A fan. 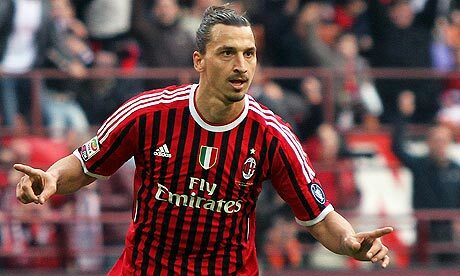 Milan do not owe €16m to Real Madrid for Ibra.it should be to barcelona. Ah, yes, don't know why I wrote that. Thanks for the heads-up. I've now corrected. Just super article my friend. superb, superb.. big thanks!! Thanks for this article, I'm a your big reader and I was waiting for one on Milan for a long time. I just want to say that the situation is even worst than I thought, I don't believe they are planning a stadium for real, I think they just talking about it because it is the right thing to do. What about the new Roma? Is there anything about them? I think it's a fascinating project. Ahh renting, the black hole of all finances. I think Juventus' stadium gives them a ray of hope, while AC Milan has problems now and they will only get worse as 2030 approaches. good job mate ;) We know much more after thsi article. Its me again with the "can we have copy on why serie A collapsed"
As a european football fan, can we have more articles on other european leagues. 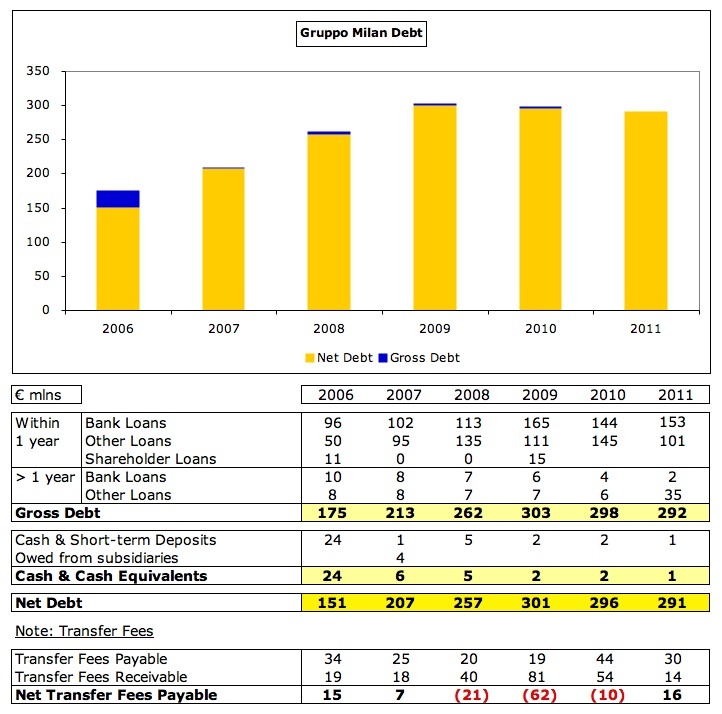 turkey, how credit crunch affects greek football, big spending anzhi mikachla. I would be interested in Russia too, why did no oligarch invest in russian clubs. With their collective wealth could they not create the best league in the world? Also, a piece on emerging nations. Could china and the middle east rival europe in the future as the premier destination for world footballers? India and the efforts of european clubs to crack that market, though failing to usurp cricket. Finally, i have a soft spot for Torino. I would love for them to be profiled. Another informative article here, as always. I think Milan can improve their financial situation a bit as long as they can keep doing well in Champions and Serie A and most importantly stop making those January buys. The squad should be trimmed and gamble more on the youngsters, a trim squad with standard wages, might cut the financial problem bit by bit.. Big squad with very huge wage bill is one of their main issues aside from not having their own stadium. I warned you on twitter regarding some follow up questions about your analysis. Regarding the bank loans. Does the club state any time limit or plan to when the debt must be paid? As you state, most of it is short term debt. Regarding the “other loans” I remember that you – in your first Milan blog – said that this was the so called factoring (and in this one I see ). Are there any more details in these loans? Why have the short term gone from 145 to 101 in 1 year etc? Is it Fininvest who are owed these amounts? 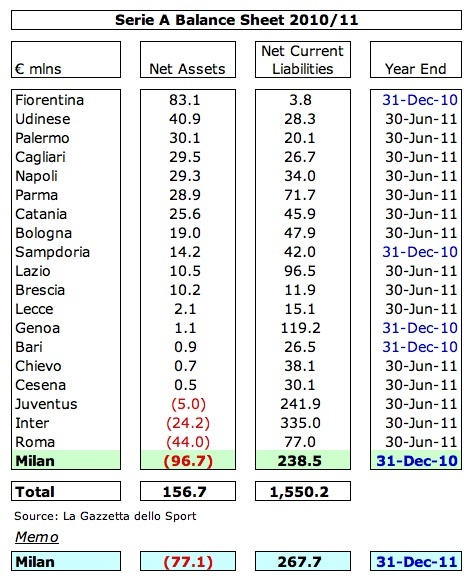 Which debt level is, in your opinion, healthy for a club like Milan? Especially concerning the possibilities of raising further debt if a possible stadium is to be built in the future? You have previously talked about some cost which could be excluded. For instance today, you said on twitter that Chelsea could exclude costs of £18 due to youth, depreciation and community. Furthermore there is the issue of contracts signed before June 2010. Do you have an idea what amount this would add up to at Milan. 1) Players: Does the accounts state how much the club paid its players for winnings Serie A. I’ve read that Ibrahimovic receives 2M euro if he wins a Scudetto. 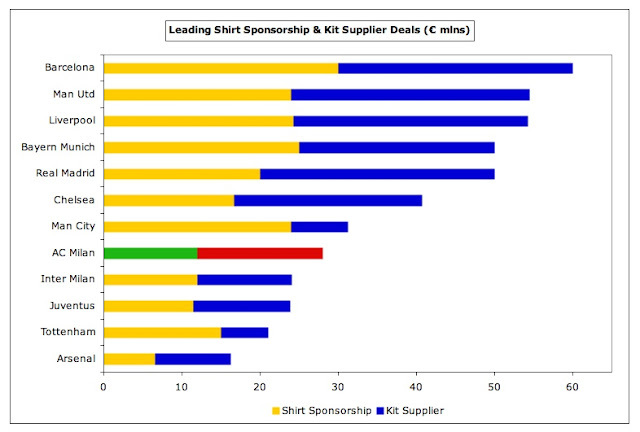 2) Sponsors: How much will the club miss out on in total due to the lack of a Scudetto. What was the total gain in bonuses? 2. Again, not much information provided with reduction in other loans described as being in line with contract signed by Milan Entertainment Srl. 3. That’s difficult to say, as it depends on the terms of current debt, i.e. interest charges, repayment schedule. The current debt levels are certainly an issue when it comes to funding any new stadium, though, as I said, there are innovative methods of financing that might help. 4. Youth costs not separately itemised in accounts. I would think Milan could justify maybe €15m for FFP exclusions, but that's only a guess. I’ve not done any analysis of pre-June 2010 salaries, but please note that any contracts extended after June 2010 would have to be included for FFP. Also many of the old guard have left this summer, so impact will be smaller. 5. Not exactly, though they do state that €13.7m of the increase in the waqe bill was due to bonus payments for sporting achievements. 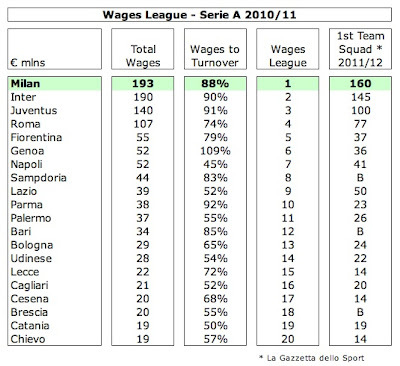 It does not say: (a) how much was paid in total; (b) how much was for winning the scudetto. 6. Total gain in commercial income mentioned in accounts for winning Serie A was €3.8m. Not as detailed a response as I would like, but I hope that helps a little. Thanks. Appreciate it. Very usefull indeed! I wondered from where you got the report since the club haven’t published it on their website? if Roman Abramovich struck an agreement with say Genoa so he or his company would donate £50Million for them to use to buy an out of favour player (maybe Ferreira), would Chelsea (or any other club) then be able to use this as a way of buying around the FFP rules? Another great article. Italian football used to be the FOOTBALL to watch in the 80s and early 90s. I think Italy has missed out after their World Cup in 1990. It was an opportunity to build and rebuild their stadia, but they only refurbished them. The result was old grounds, (fair enough, they were new inside) with running tracks which spoil the game and the atmosphere in the ground. I remember going to the old Stadio del alpi in Turin for a game v Manchester Utd, atmosphere was awful. Juventus have understood the issue and have now a new (albeit smaller than before) football ground. Surely, they will be loopholes in the FFP rules. What will stop Belusconi (or any benefactor) from signing a 50m euro (or more) shirt sponsor deal from one of his companies? With Genoa-Milan were pure player swap, so it did not affect the cash flow, (with Egyptian-German deal a exception, but normally transfer in Italy always in instalment as Lega Calcio had a centralized fee distribution system) However Milan do had to pay for Amelia, Boateng and Paloschi in real money. Back to year 2010. Why amortization raised to such level was basically exchange deal again. In 2010 Milan bought 3 players from Internazionale for 7 million, however none of them with the current squad: Filkor, Daminuţă and Fossati. as they were bought in mid 2010, their amortization counted for 0.5 year only, which 2011 was the first full year the deal made effect. Assuming 4.5 year contract, they at least made Milan had to amortize 1.5 million a year. If the player do worth 7 million or more in the future, that just a risky investment, but eventually worth nothing, a suspiciously 7 million transfer to Inter. Then back to Genoa-Milan deal. Papastathopoulos's deal was actually paid via cash plus player deal. Despite the players Zigoni, Oduamadi Strasser left the club in co-ownership deal and again returned to Milan by purchase half, their book value were again based on 2 times the bought price of the 50% registration rights. Again, Papastathopoulos's amortization cost was half in 2010 year (just 1.4 million). But in 2011 it was 1.4 million in the first half of the financial year plus the amortization of Zigoni, Oduamadi and Strasser! Which certainly more than 1.4 million. Then the 2011 swap deal. Gain of Pasini actually came from the purchase of Chinellato and Sampirisi came from Pele, the swap deal again increase amortization. We did not know the true value of the players yet, but the gain from player swap was stacking the effect of amortization. Lazio used another approach. Instead of labelling a value for the players they signed in cash-plus-player swap, Cana, Pandev and Garrido all "worth" a peppercorn in their accounts to avoid some future amortization or accuse of over-valuing in order to flop the selling profit. Could Milan book El Shaarawy signed for Milan for 10 million (5 in half), 5-year contract and the sale of Merkel for peppercorn? Certainly can, then the net effect on Milan was 1 million amortization cost only in 2011 (note that co-ownership deal was treated as full card in amortization, the full amortization schedule would be 1-2-2-2-2-1) and 10 million selling profit on Genoa account (not that the profit in co-ownership, half of them would became co-ownership asset/payables/credit and the effect on future re-negotiation became financial income/cost). However in currently schedule, it would be 10 million selling profit on Milan and 2 million amortization (2-4-4-4-4-2) and GENOA 20 million profit and 1 million amortization (1-2-2-2-2-1). As you state there are many rumours regarding the club wanting to sell 40% of its shares. But isn't far from certain that the money from this sale would benefit the club? It could might as easily just go back to Berlusconi family in order to get som back for all the investments during the years? Will you be looking at the up coming FFP and doing an overall analysis of the clubs who will be under the spotlight so to speak? If berlusconi signed milan under fininvest or another company that he owns and he struck a mamoth sponsorship deal, that would certainly be a way for him to still provide for milan whilst abiding the FFP right? Fantastic article, really! You've done an amazing job! Keep up the good work! "If berlusconi signed milan under fininvest or another company that he owns and he struck a mamoth sponsorship deal, that would certainly be a way for him to still provide for milan whilst abiding the FFP right?" I don't like FFP. It applies the same financial rules to a club like Arsenal (owns their stadium) to a club like Mlian (big rent payments). @swissramble: what're the odds re players/agents suing on the grounds that FFP is a back door salary-cap, and an anti-trust violation? um that doesn't seem right milan were making a active effort to make cost saving policies but in 2010 in addition the club cut 50 million euros for the nezt 3 season of the wage bill with the sale of kaka something like 19 million euros after tax in addition milan wage bill seem to increased by 30 million euros in the 2010 period yet as pointed out milan had already made a saving. in addition milan cut a further 15 million euros off the wage bill from various loans and sales. 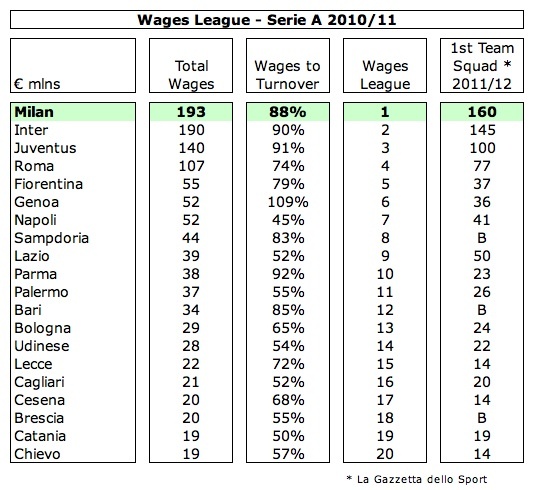 the incoming cost of wages don't really account for that milan signinsg hunterlaar borriello and oneywu wages after tax added up to 18 million euros. 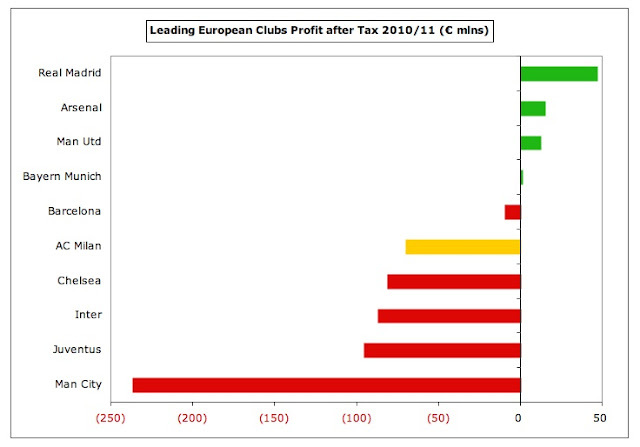 added that the club announced post tax profits of 32 million in 2010 or that is at least what i remember. Unbelievably good article. Thanks so much. can you tell us what was changed after ibra and silva left ac milan? Leeds United - Marching On Together?